An opulent and breathtakingly beautiful wedding ring crafted from luxurious 9ct yellow gold. Set in a wish bone V shape to allow the band to sit comfortably alongside your engagement ring, this stunning wedding ring is set with a row of dazzling diamonds totalling a fifth of a carat of diamond for eye-catching sparkle. 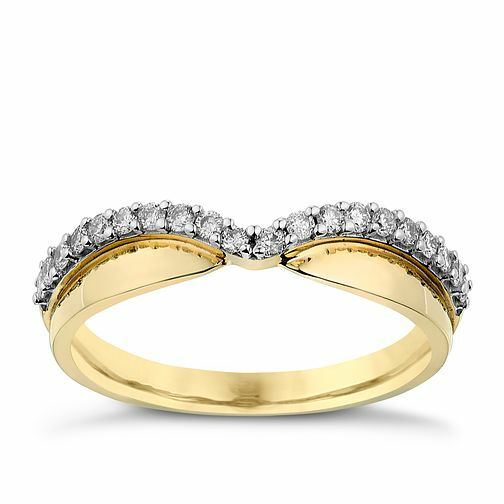 9ct Yellow Gold Wish Bone Shaped Diamond Wedding Ring is rated 5.0 out of 5 by 3. Rated 5 out of 5 by Anonymous from Beautiful ring I love how this ring looks alongside my engagement ring. It frames it beautifully. Very happy with my purchase.